Jake Swamp, Tekaroniaken, a Haudenosaunee elder had a dream about a river and people who could not lift their heads, a hand touched his shoulder and told him, you have to help them. For years he sought to understand his dream and then the vision came to him. Indigenous Peoples need to grieve in order to heal. The pain that stems from the atrocities committed against our people is still present in our communities. It is imbedded in our collective memory. We have passed on our traditions orally from generation to generation. We have passed on our pain as well. If pain is not dealt with, if we do not grieve, the pain will consume us. And so it is. We have abhorrent rates of alcoholism, drug abuse, suicide, incarceration, domestic violence, and child abuse. In this time of great pain and confusion, Jake Swamp’s dream, his vision, evokes the need to heal and the spirit of hope for a new time to come. His dream and vision offers us a way to close the wounds that Indigenous Peoples have collectively suffered. The following is the dream that elder Jake Swamp had and which has now been supported and sponsored by Indigenous Peoples from the East and the West of the United States and Canada, as well as from Indigenous Peoples from the rest of the Americas. 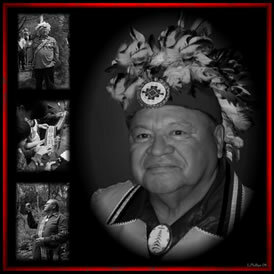 The Elder Tekaroniaken Jake Swamp passed on to the spirit world on October 2010. He left us behind to fulfill the instructions of our ancestors. To honor his dream we are planning the Gathering at the banks of the Mississippi River so people can receive condolence, strength, and inner peace to reaffirm their right to walk the same way as our ancestors once did.